Part 1 of this blog post described my tiny garden vineyard in London and the first harvest from all of five vines, of different varieties. The idea of making wine from so few vines, and of such inharmonious varieties, is of course preposterous. No good could come of it, but neither are wine grapes much good to eat, which left only three options: throw them away (you are kidding), dry them, or make wine. I’m making wine. Next year I may dry them. 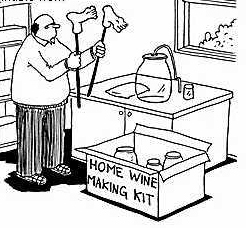 This was not quite my first attempt at winemaking. In my relative youth I tried it using canned grape juice sold for the purpose. The results were dreadful even to my then uneducated palate, but it was fun and it introduced me to demijohns, airlocks, sterilisation and fermentation. I also learned that most suppliers of this apparatus are more into the brewing of beer than the making of wine, but there is a lot of overlap in technique and equipment so they usually have the required items. Singapore is our second home and I was there throughout the British summer, but my vineyard assistant (a.k.a. The Wife) was in London until 29th August. 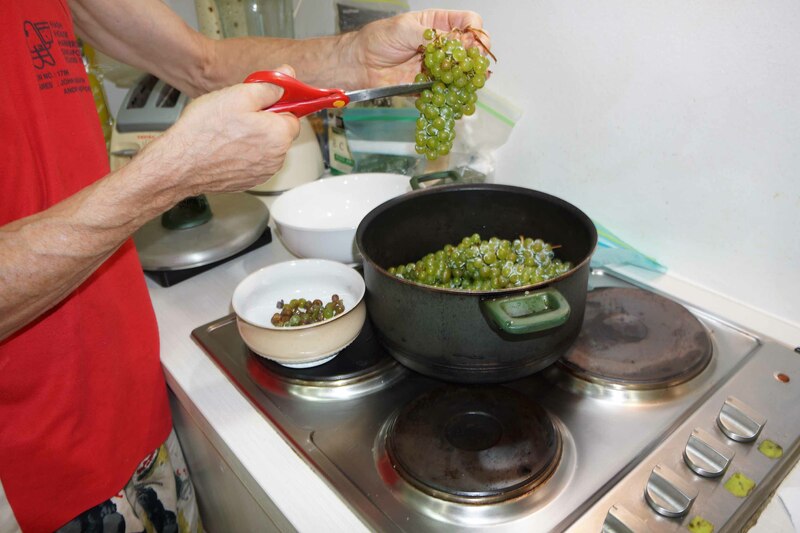 So just before leaving London, Angela harvested the grapes, put the bags of fruit in her suitcase and then brought them to Singapore, where they arrived with little spoilage despite the 13 hour flight. It would have been better to let the fruit ripen for another few weeks but then there would have been no-one there to harvest them. They didn’t taste very sweet and the pips were still green but there was fun to be had and nothing to lose. From the above it will be clear that Singapore does not have strict rules against bringing in foodstuffs, unlike say Australia and New Zealand. 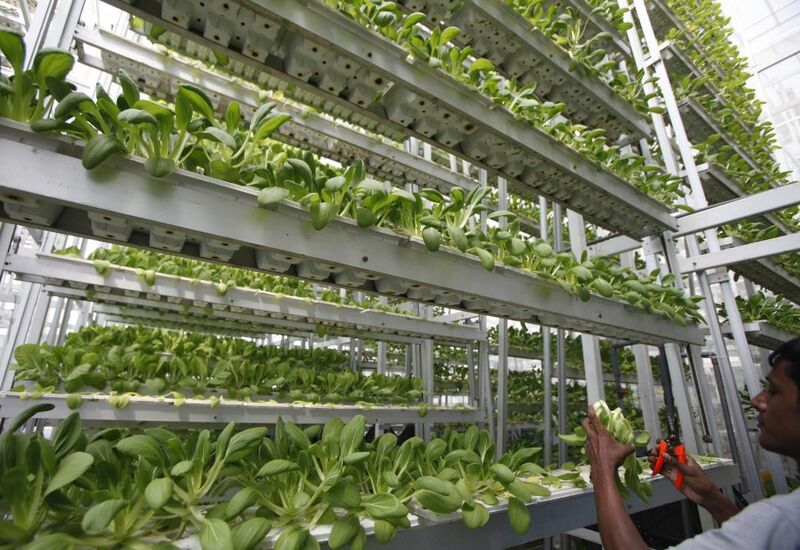 This is because the agri-business is small and increasingly technological, such as hydroponic lettuce and vegetables grown in glass skyscrapers. There are a few rules. The ban on importing chewing gum (because it jammed the train doors) is well-known if misunderstood: you can’t manufacture it or sell it either, but it is legal to carry in a single packet for personal use. Also, you cannot find poppy seeds in the supermarkets. They contain no narcotic alkaloids but the government doesn’t want to take the risk that someone will succeed in germinating them. But I digress. Would Singapore have brewing shops? Of course it does, while pubs with their own in-house micro-breweries have been very successful here for at least twenty years. So home with a demijohn, airlock, immersible thermometer, a sachet of wine yeast and another of Camden tablets (sodium or potassium metabisulphite, for making sterilising solution that releases sulphur dioxide). Meanwhile mail order provided a refractometer for measuring sugar content (Brix), a pH meter, and potassium bicarbonate in anticipation of needing to reduce acidity. Out of the drawer came muslin cloth for making the press wine and general filtration, and a funnel. Ça suffice. Actually I have a titration kit for measuring acidity too, and a cork-driver, but both are in London. They can wait, as neither is required yet. First stage, destemming and selection. Next, crushing. By pigéage à pied, of course. Proper fun! Into the demijohn. Demijohn: a much nicer term than fermentation vessel or carboy. 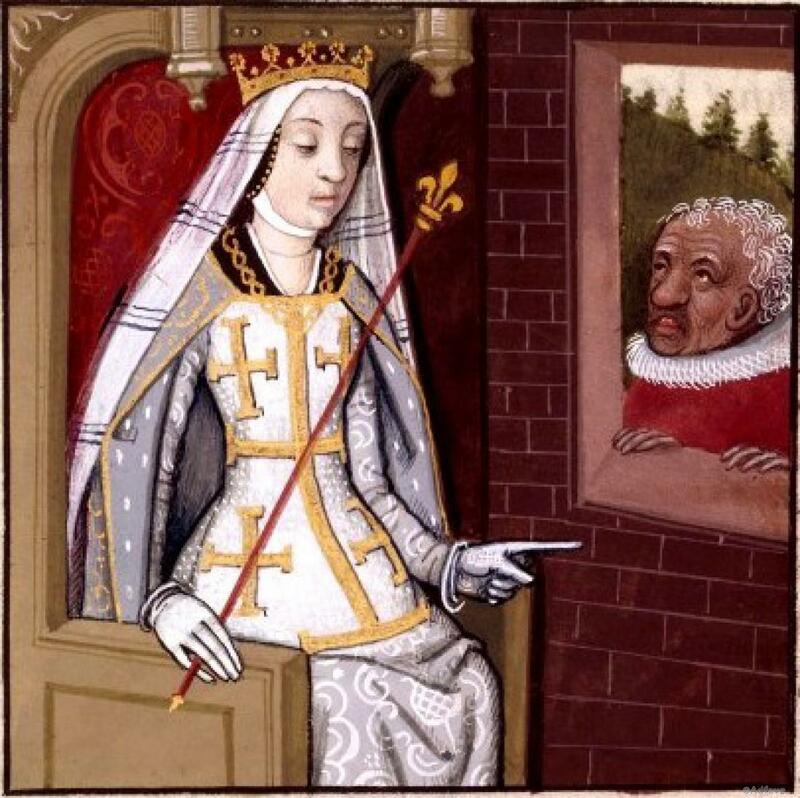 Did you know that, according to legend, a dame-jeanne is named after the feisty Queen Jeanne who, after expulsion from Naples in 1347, took refuge with a glassmaker in Provence? Love it. While we’re about it, carboy is from the Arabic qarrābah, meaning a big jug. At this stage, the colour of the must was as expected something close to clairet. This is the traditional dark pink wine of Bordeaux, made by running off the free-run juice after only 24 hours of skin contact. The term claret for red Bordeaux is derived from this. 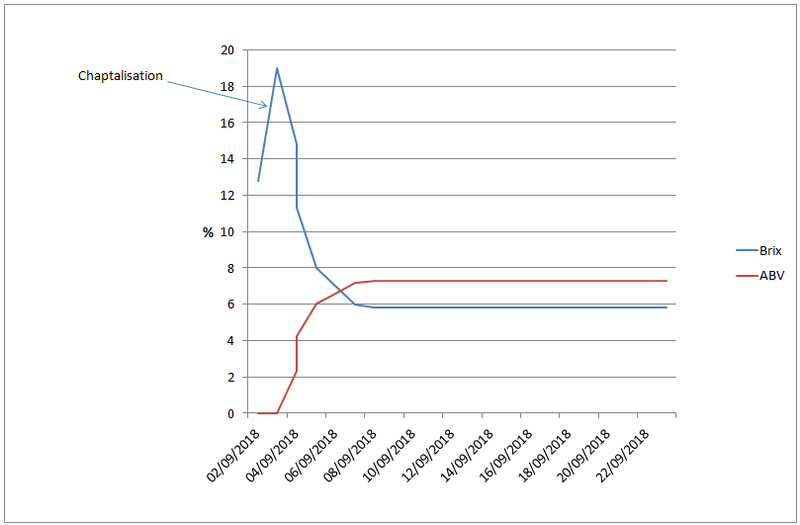 Testing showed that Brix was only 12.8% (i.e. 12.8% sugar content by weight), equivalent to about 7% abv if fermented to dryness, though there may be further sugar in the skins that takes time to leach into the must. The usual starting point is about 23% Brix, giving 13.5% abv. So Chaptalisation (enrichment) was needed i.e. addition of cane sugar. EU wine law (Annex I D) allows raising abv by 4%, though local regulations may forbid or restrict it. Taking my lead from that, a target of 11% abv was chosen, requiring raising Brix to 19%. How much sugar would this require? The total sugar content must be 19% of the final amount of wine, but that is as yet unknown. The current weight also includes the pomace. A rule of thumb is required, which is that the juice accounts for 65% of the weight of the must and the pomace for the other 35%. 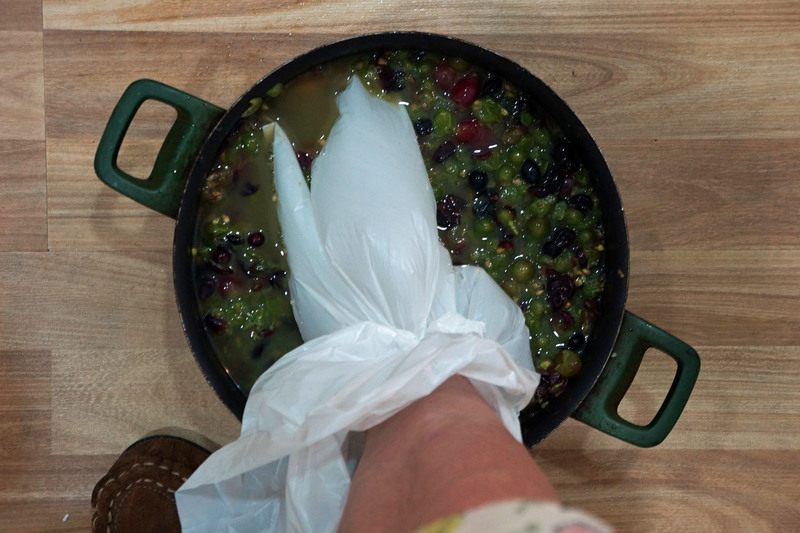 So my 2.7kg of fruit should produce about 1.75kg or 1.75L of wine. Thus raising Brix by (19% – 12.8% =) 6.2% required 6.2% of 1.75kg = 110g of sugar to be added. In fact this left Brix a bit below target and an extra 25g of sugar was added for good measure. Fermentation. 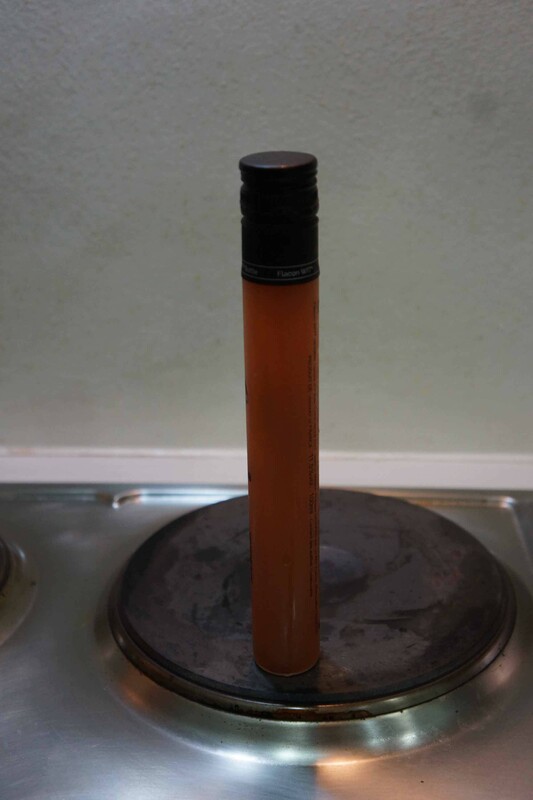 Three grams of dried yeast (Saccharomyces cerevisiae ) were rehydrated and fermentation was begun on 3rd September. Activity started within ninety minutes and progressed rapidly. but this is not the action, merely the principal actors. Glucose does not spontaneously turn into alcohol; if only! Enter yeast cells, left, as host and catalyst. They, like us, love sugar. The glucose enters through the cell wall and undergoes a series of reactions, creating many intermediate products, but finally CO2 (which is burped out) and ethanol (which, let us say, is peed out). The CO2 bubbles out through the airlock but fermentation also gives off heat. In fact the word derives from the Latin fervere, to seethe or boil. This loss of calories explains why non-Chaptalised wine is less fattening than the juice it is made from: good news! This is true even for sweet wine (unless Chaptalised or fortified). But combined with the 28°C ambient temperature in Singapore, the fermentation needed to be cooled. White grapes are normally fermented between 12-17°C if a fresh fruit ‘New World’ style is sought, or 18-20°C for a more savoury ‘Old World’ style; Burgundy-style Chardonnay may be allowed even higher. 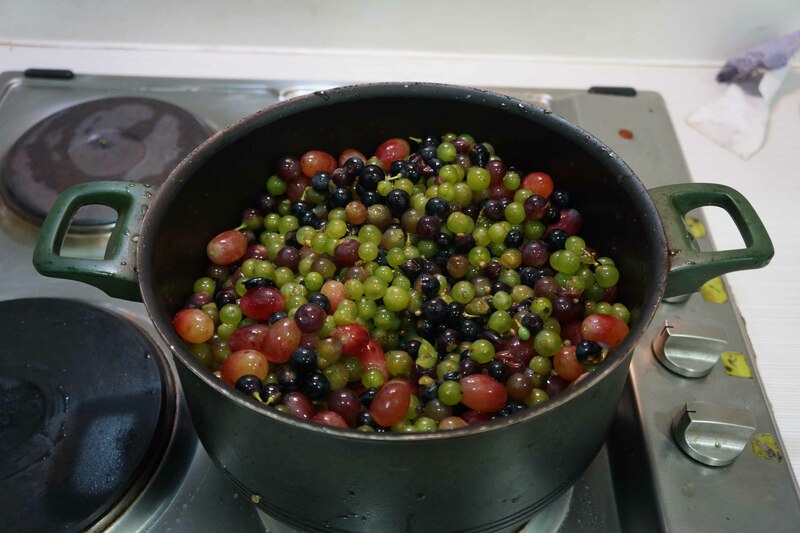 Red grapes are usually fermented between 25-30°C, the higher temperature aiding colour extraction. At this temperature the whites in my blend would lose their flavour and, as a pink wine is expected, colour extraction was not a priority. 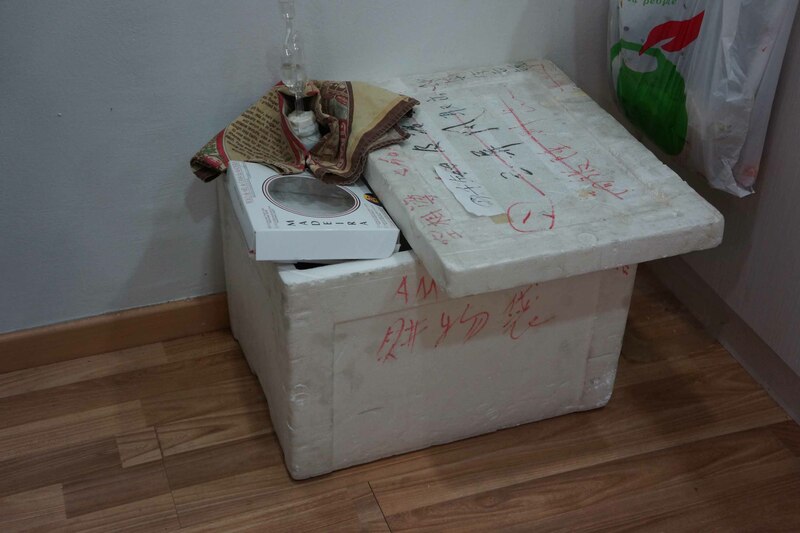 Using an ice-water bath in a polystyrene tub, must temperature was kept in the range 20-24°C for the first few days. 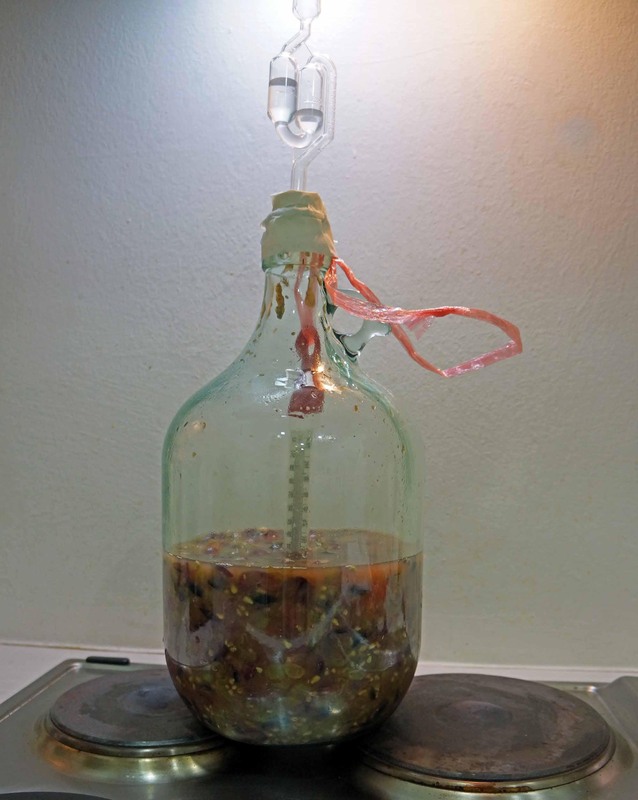 During this period, the demijohn was shaken vigorously morning and night to wet, break up and mix in the cap (floating pomace) – the equivalent of remontage in vats or tanks: pumping the wine out and spraying it back over the cap. By the sixth day, Brix had dropped to 5.8%, implying 7.3% abv. I now had a medium-sweet low alcohol wine, but it was wine! And then… no more bubbles. A stuck fermentation. This required an additional and unplanned stage to the winemaking, one that took me into unfamiliar territory and is still in progress. And this post is long enough… so it will be continued in Part 3. Watch this space. No, go drink some wine.